This week I wanted to investigate why Bon Appétit has such a tight community of workers. I learned that the Andrew Commons is composed of two parts. 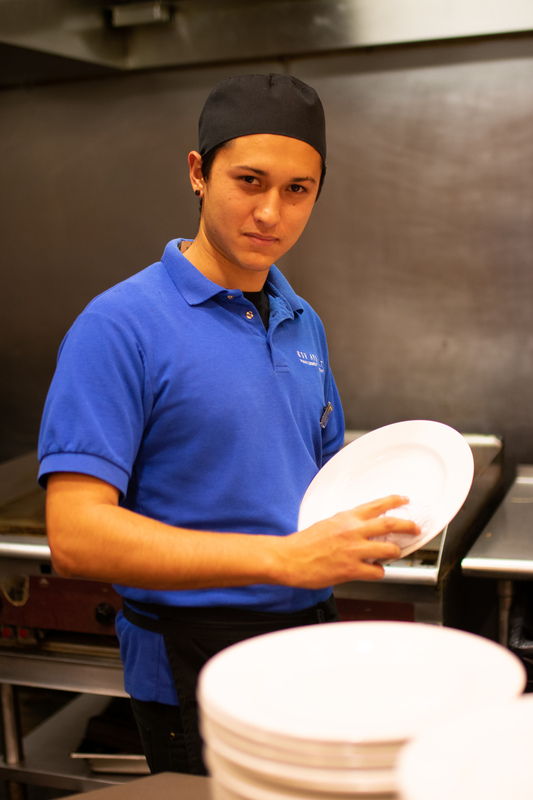 There is the front house where workers serve, prep and clean up, and there is a back house where students wash dishes, load the dishwasher and make sure the service is running smoothly. Most students hear about this job through the Freshman Job Fair. Students can apply for a position through the application as well as Handshake. In the past, student workers had to apply for promotions, but now the staff approaches individuals to accept the position to make sure the person is the right fit for the job. This has proven to be successful. Freshmen Quintin Giglio, Jeff Mason and Esther Wang have been working in the front house at Bon Appétit since fall term. Seniors Michele Haeberlin and Eddie Hood are student supervisors. Giglio is currently a provisionary supervisor in training doing all front house server duties and moving into a role of managing students. In this position, he supervises food service areas, making sure the student staff has proper clothing and can get the food when they need it. Outside of his job, he is a photographer for The Lawrentian and participates in the Makerspace and Film and Photography Club. He works four times a week for four hours, which is equal to one meal. He is in the engineering program and wants to pursue a degree in Environmental Studies. Mason is in training to be a supervisor to take more responsibility in the front house as well as manage some of the back house. He will sometimes take extra shifts besides three shifts a week for dinner. He enjoys the everyday interactions with his fellow peers. He aspires to be an English and Computer Science double major. He is also the secretary of Creative Writing Club. His job has given him a good work ethic, a skill he believes he can take with him after he graduates. He wants to encourage other students to work for Bon Appétit because it is convenient and they can learn essential life skills. Wang thinks that food is important, and when students come in with confused looks from all the food options, she hopes she could be of help and likes making recommendations. “Food is a common topic no matter what preferences you have—it’s something you need to survive,” she added. She works evening shifts on week days until 9 p.m. and Sunday brunch from 10:15 a.m. to 1:45 p.m. She plans to work at Bon Appétit for two years because she plans to study abroad junior year and handle the work load senior year. She believes communication is the most important lesson she has learned on the job. Wang hopes to be an East Asian Studies major and enjoys listening to music, attending class and learning about Japanese culture. Hood has worked for Bon Appétit all four years because he loves his job and the people he works with. He assists in the interviewing and hiring process, which begin at the beginning and end of the year as well as present in orientations. Prior to his promotion, he was the shift lead who delegated tasks and made sure everyone came in on time. Since he is a Theatre major he appreciates being able to choose his own hours. He admires that his fellow coworkers come from different backgrounds, majors and interests. His shifts are every Friday night from 4:30 p.m. to 7 p.m. and Saturday from 10 a.m. to 2:30 p.m. The rest of his week is flexible and he is willing to work overtime when needed. Haeberlin has worked at Bon Appétit all four years. She gravitated towards it because she worked at a family restaurant before college and wanted a similar work environment. Plus she likes her fellow coworkers. “My favorite part of the job is twofold—one is training a person and then seeing their excitement when they do something correctly on their own and feel pride, and the other is, again, the tight community of friends I have made with the adult workers and chefs,” added Haeberlin. She has learned how to handle emergency situations and how to handle people who do not speak English and training them, how to deal with various learning styles and how some people learn quicker than others, how to manage but not be bossy or condescending and how to be confrontational about a serious issue but make it not aggressive or in a negative tone. In addition to working at Bon Appétit, she writes for The Lawrentian and is a Residence Life Advisor. She used to model, as well. Outside of work she is a board member of the Melee Dance Troupe, a singer in the Viking chorale, a board member of KCC and currently helping lead the Cabaret K-pop dance group. All the workers agreed that the benefits of Bon Appétit are flexible hours, convenient commute and a free meal. It is also the largest student worker organization with the highest paying salary. There are many chances for promotion and good work does not go unnoticed. The workers agreed they have learned organization skills, punctuality and time management—all useful skills that are needed when applying for a job. It goes to show that it does not matter what you do as long as you enjoy doing it.